In early hours we have visited The Cat's Eye. There were 3 Black Holes in the system, orbiting each other. But the real thing was when you first jump to that system. Jumping right into a black holes body exlusion zone is truly something. Scary at first... You think the journey ends there in a split second, until your brain realizes that you are not dead yet, and the ship is intact. Probably it is every commanders nightmare. After visiting there, we moved on to our next destination called Sky Motion. Kept on using the Neutron stars on the way, but then Eternal Eden's frame shift drive started malfunctioning. I reboot the ship systems to overcome the situation. It is still working for now but still malfunctioning every now and then. I quit using the neutron stars for the moment. There is a deep space outpost not so far from us. I plan to visit there after seing the Sky motion. So we reconfigured our route again with the nav officer. Now we are at Sky motion. We visited the Commander Hrdina's beacon and then decided to visit that tiny moon orbiting the white dwarf. At the first try, I realized that the moon is actually orbiting inside the stars gravitational field. 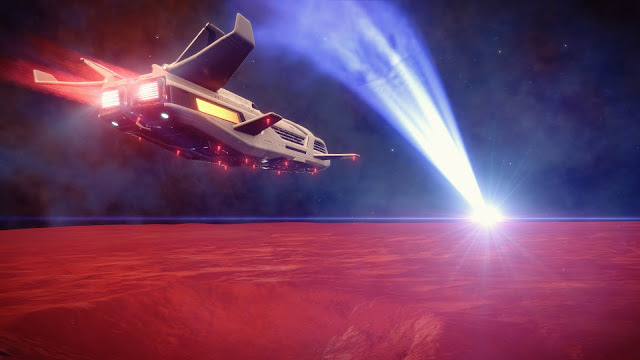 While trying to get closer, ship has executed emergency drop from supercruise couple of times. But then I realized that the moon is orbiting so fast. We waited for the moon to get closer to us, instead of trying to aproach it. But there comes another problem. When the moon got close to us aprox. 7 Mm. we got captured by the moons gravity too and, now we started to orbit with the moon. 7 Mm is still too far from the surface to aproach with normal thrusters. So I tried to engage supercruise one last time. Ship started to heat up, but it worked. Used couple of heatsinks until we began to glide. But when we get to the surface I understood why this place is so important. You can see the view taken from the moons surface on attached image. That is truly something to see. We will stay here for a couple of orbit periods to take some more pictures. After that our next route will be the deep space station for some maintenence. If I can find an AFM module there, I plan to change the cargo bay for it. There are still many Neutron stars on the way, and without using them I fear we will not return in the scheduled time.